Building bluebird nest boxes is a great way to help conserve birds at the local level. Nest boxes help maintain bluebird populations that have declined by as much as 90%. 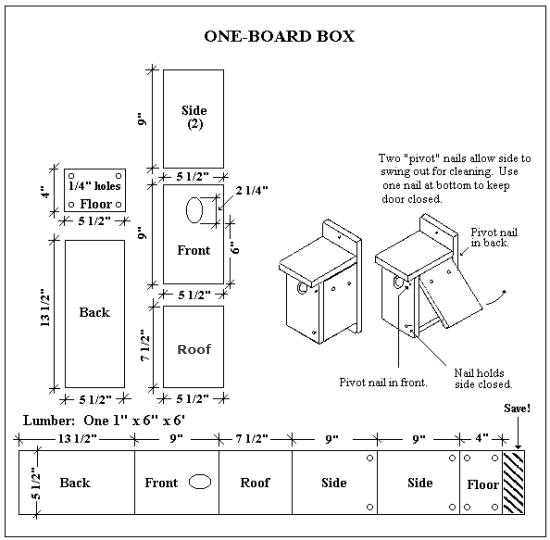 Below we have included free bluebird house plans, a simple one-board box that's relatively easy to build. Building and mounting them properly will help deter predators and competing species. Below you'll find some great links to information about bluebirds and free bluebird house plans. Note that there are several different designs including NABS, Peterson, Loren Hughes Slot, DANDR, Troyer, Gilwood Carl Little and Gilbertson house designs, just to name a few, and slight dimension differences (hole size) for eastern, western and mountain bluebirds. Another one-board bluebird house plan is here (pdf). Bluebird Inspect Bird House Before Making a Final Decision - "I like the open floor plan." Bluebird House Plans That Keeps Nestlings Cool - These plans use air-gap construction and heat convection to draw cool air into the nest box on hot days. When the temperature gets into the 90s during the summer months, birdhouses can get dangerously hot inside for eggs and chicks. 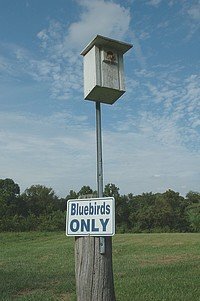 North American Bluebird Society - Here you will find recommended bluebird nest box specifications as well as 5 other styles of plans. This is one of the best sites for information on bluebirds and nest box plans. Western and Mountain Bluebird House Plans - A Nest-Box Plan for Western and Mountain Bluebirds This is a fairly easy box to build. The large roof provides extra protection from rain and predators. Eastern Bluebird House Plan - A nest-box plan for cavity-nesting songbirds. Can be used for Eastern Bluebirds, flycatchers, swallows, titmice, chickadees, nuthatches, and wrens. Any of the above blue nest box plans will likely attract bluebirds. The most important element is getting the entrance hole size correct, especially to eliminate larger pest birds such as starlings from using the box. For a round entrance hole, eastern bluebird boxes should be 1 1/2 inches in diameter and 1 9/16 inches for mountain and western bluebirds. You can then follow our general information and tips on making bird houses regarding placement, wood type and thickness, ventilation, predator prevention and more. Your best best for attracting eastern bluebirds to your bird house is to install it in bluebird habitat which is typically open country or semi-open grasslands with scattered trees and small bushes. Examples would be meadows with short grasses and shrubs, orchards or even your backyard lawn if it is large enough or has a good ratio of open space to trees and/or shrubs. Western bluebirds will also prefer semi-open country, not so much open meadows, but scrubland with some trees. We often see them here in cut pinyon-juniper stands where there is a lot of downed wood, some small trees and shrubs. Mountain bluebirds prefer habitat usually found above 7,000 feet in open coniferous and deciduous forests and subalpine meadows. It would not hurt to grow or plant native trees and shrubs, especially fruit-bearing plants such as mulberry, flowering dogwood and native Viburnum species such as arrowood viburnum (Viburnum dentatum) and hobble bush (Viburnum lantanoides). If you plan on installing more than one bluebird house, make sure they are placed a minimum distance of 125-150 yards from each other. Otherwise you most likely will have only one pair because the territory size will encompass more than one nest box. You can also place nest boxes in pairs 5-25 feet apart so other compatible species like Tree Swallows can also nest. Bluebirds and Tree Swallows don't mind nesting close to each other. Five feet seems a little close to me, but it has worked for some people. But don't expect different pairs of bluebirds to nest closer than 125 feet from each other. They have to have an exclusive area for all the food they need to lay eggs and to raise the chicks. House sparrows can be a real nuisance when you are trying to attract and then hopefully have bluebirds nest in your box. They are an aggressive, introduced, non-native species that will be persistent at taking over your bluebird house and, if needed, will kill adult bluebirds as well as nestlings. If you have house sparrows in your neighborhood or wherever you will be erecting a bluebird box, then you will want to take some precautionary steps to reduce the chance of providing a bird house for sparrows instead of bluebirds. We have had to monitor more closely when house sparrows started showing up in our neighborhood and actually killed one of the adult tree swallows that was using our box. There are specific bluebird house designs that are meant to deter house sparrows from using them. 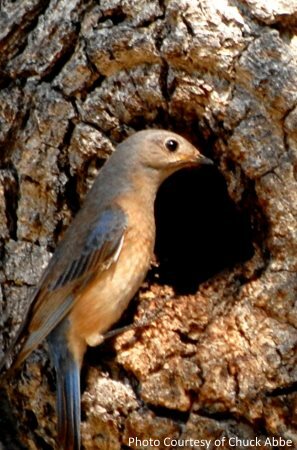 he DANDR Bluebird Nestbox is a slot design and has been approved by the NABS (North American Bluebird Society). Other tests results show that house sparrows will use the slot entrances. Some say that the Gilbertson PVC bird house plans (pdf) is the only design that will really deter house sparrows. The body of the house is made from PVC pipe, the roof and floor from wood. To make it more attractive you can take a dark stain and paint horizontal streaks across the pipe to make it look like birch bark. If you look at the example in the above pdf file (also pictured left) it really does look natural. There are a few disadvantages to this design as opposed to others such as having to open the box from the top instead of a hinged side door and the thin 1/16" walls are not as heat resistant as thicker wood walls would be. The thinner PVC is used so that it can be flexible enough to squeeze and remove from the attached roof via pins. But if you have a serious issue with house sparrows then these cons aren't so bad. But note that there is no 100% house sparrow proof bird house. Some will always find a way. Some have even gone so far as to say that it is better to take down all your boxes than to let House Sparrows breed in them. And we agree, so do what you can to keep the invasive House Sparrows out. The potential high temperatures in the nest box should always be a consideration for bluebird box designs and placement. It has been shown for Eastern Bluebirds that dark boxes were "consistently and significantly hotter than light [colored] boxes". Bluebirds in dark colored boxes had "higher embryonic (eggs fail to hatch) and/or nestling mortality". Nestlings in dark colored boxes were in poorer condition than those in light colored boxes, due to heat stress (Doc file). The issue seems to be the amount of time the temperature of the nest box exceeds 40°C ( 104°F). Conley Black states outright that temperatures that exceed 107° (F) will kill bluebird eggs and chicks. Even if eggs or chicks are not killed by the heat, heat stress will cause them to grow slower and have less chance to survive after fledging. They can't grow properly if they are fighting for their lives due to the heat. So always consider placing boxes on the east side of a tree or building to avoid the hot afternoon sun or to consider a double roof box design. Also think about providing temporary shade on extremely hot days (if the temperature is 98°F in the shade, what is the temperature in the nest box if it is in full Sun?). It may disturb the parents some, but almost anything would be better than letting the chicks die. Tree swallows, chickadees, wrens and other birds may use your nestbox before, instead of or in addition to bluebirds. We saw a few bluebirds in our neighborhood when we first moved here. It is a fairly new neighborhood that still had some open fields and meadows with scattered juniper trees that the bluebirds liked. So we put up a bluebird box and waited. We maybe saw bluebirds once or twice again, but the first couple to use the box were tree swallows. Sure, we would have liked to have bluebirds but the tree swallows have come back year after year, and have fledging many chicks and we wouldn't change a thing. So don't get too bent out of shape if other native species other than bluebirds use your box. 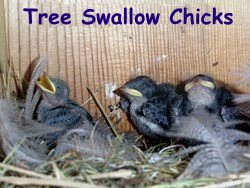 You could also try placing a second box nearby as many species such as tree swallows and bluebirds can occupy nest boxes very close together without problems. Below are some great bluebird house designs including the highly-rated Audubon coppertop cedar bluebird house that bird watchers have had great success with attracting bluebirds. We highly recommend the Stokes Complete Guide to Guide To Attracting Bluebirds . 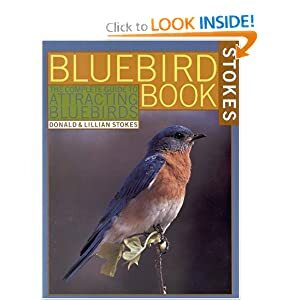 It is a great comprehensive book that not only covers how to attract bluebirds, but also has complete life history information and fantastic bluebird photos as well. Bluebirds require a variety of food as part as their diet, including fruit, and you may want to try bluebird nuggets which are a special blend of beef suet, peanuts, grain and raisins to fulfill their diet needs. A bluebird trail is a series of bluebird nestboxes that are placed along a property boundary or along a path or trail to provide suitable breeding sites in areas where natural cavities may be limited. It can be just a few boxes on your private property, or the trail can be miles long and have 100s of boxes on public land. Bluebird trails have been started by interested individuals, Eagle Scouts as service projects, by volunteers, at colleges and universities, conservation organizations and bird clubs. Much of the land that used to be natural habitat or agricultural land is now covered with houses, shops and parking lots. The trees, shrubs, flowers and lawns that we plant for landscaping still attracts birds as they look for food and places to raise their young. Many birds build nests in the trees and shrubs, but what is usually missing from many urban areas are potential nest cavities in the form of dead trees. Dead trees are quickly cut down and removed from our parks and yards because we don't want falling trees to damage property or to hurt someone. So cavity nesting birds can be missing from list of species if we don't provide nest boxes. Natural cavities are usually is such short supply, that birds usually start investigating them almost immediately after they are put up. Build it and they will come.